With over 35 years of International Experience, Dr. Faruq has been an ardent advocate of minimally invasive Laparoscopic surgery since early 90’s. 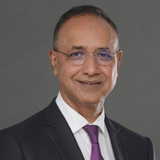 He started his medical career in India as a General Surgeon in 1982 and migrated to UK and Ireland in 1991 for higher Surgical Training in Laparoscopic Surgery. He was conferred with the fellowship of the Royal College of Surgeons of England in 1993. He was working in Ireland as a Consultant Surgeon until 2001. He further received higher training in Obesity Surgery at highly renowed training centers in Brussels, Strasbourg, France, and at New York. For the past 15 years, Dr. Faruq has been residing and practicing surgery in Dubai. He is frequently invited to speak at National and International conferences on topics related to Weight Loss Surgery and Hernia Surgery. Dr. Faruq also has several publications to his credit. Organizing Chairman for the last 12 years of the renowned Annual Middle East Surgery Conference held in January every year during Arab health, President of Gulf Obesity Surgery Conference in Dubai in December 2014. He is a member of the International Federation for the Surgery of Obesity (IFSO) and is an active member of its Scientific Committee and Membership Committee.